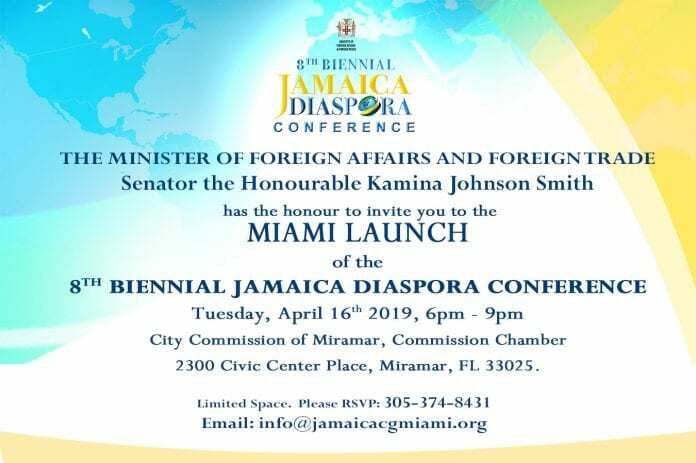 The Jamaica Consulate General , Miami, will host the launch of the Eighth (8th) Biennial Diaspora Conference next Tuesday (April 16) at 6:00 p.m., at the City Hall of Miramar (Commission Chamber) located at 2300 Civic Center Place, Miramar, FL 33025. The event is free to the public and continues the conference launch series taking place across Jamaican Diaspora communities. BROWARD COUNTY, FL – The Medical Marijuana Advisory Board will host an Educational Summit on Wednesday, April 17th at 9AM at the Anne Kolb Nature Center, Mangrove Hall, in Hollywood to discuss the legal issues of medical marijuana and the financial impact to the State of Florida. The summit is for elected officials in Broward County and the keynote speaker is Commissioner of Agriculture & Consumer Services, State of Florida, Nicole “Nikki” Fried. Broward County Medical Marijuana Advisory Board. Speakers include Commissioner of Agriculture & Consumer Services, State of Florida, Nicole “Nikki” Fried, Advisory Board Member Seth Hyman, Representatives from Trulieve, Surterra and Knox Medical and Evio Labs Eric Stevens.